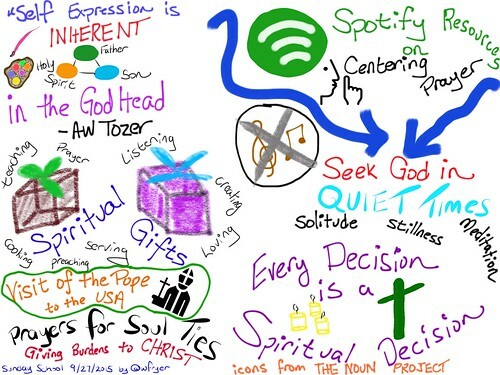 These are my sketchnotes from this past Sunday, in our Sunday School class and late church service. I added both to my sketchnote Flickr set. I created the first one with ProCreate ($6) on my iPad, and the second one in Forge. (free) The ProCreate Sketchnote looks a lot better… I’m not sure if I just took more time with it, or if the tool setup in ProCreate lends itself more to better illustrations. I was going to narrated the Sunday School one, as I have in the past, but for some reason iMovie for iPad won’t import the exported video. 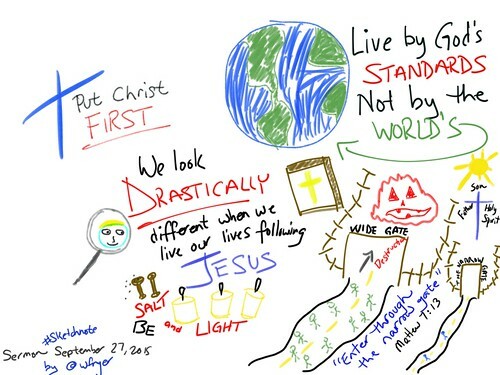 Sundays tend to be my main opportunity during “the regular week” for me to practice visual notetaking.